EPIC ICE! Proclaimed the subject line of an email sent to several dozen people earlier this week, and subsequently forwarded to ever widening circles of area residents. This winter has certainly been epic; and ordinarily a subject line like this probably would have presaged yet another storm warning, followed by another step for me down the ever deepening dark well that has been this unrelenting winter. Miraculously, what followed in the body copy had the opposite effect. The email was alerting those lucky enough to receive it of a unique event that occurred this weekend. In addition to treacherous driving conditions, roofs collapsing or leaking under the weight of the snow, and general malaise, this winter has produced a mammoth patch of relatively smooth, clear ice, stretching 15-20 miles from Rhinecliff to Germantown. Perfect conditions for a “Historic Rendezvous” of ice boats, organized by the Hudson River Ice Yacht Club which would be centered around Astor Point, just south of Barrytown. While generally not a fan of winter sports (or winter, or sports for that matter), I found the prospect was exciting. We are very fortunate in that this area is one of the epicenters of ice yachting in North America. From humble bulkier ones used to transport people and freight in the late 18th century, to sleek wooden models built by the estate owners of gilded age estate owners, to the zippy racing models of today, the ice yacht has been a romantic part and parcel of the historic Hudson Valley identity. 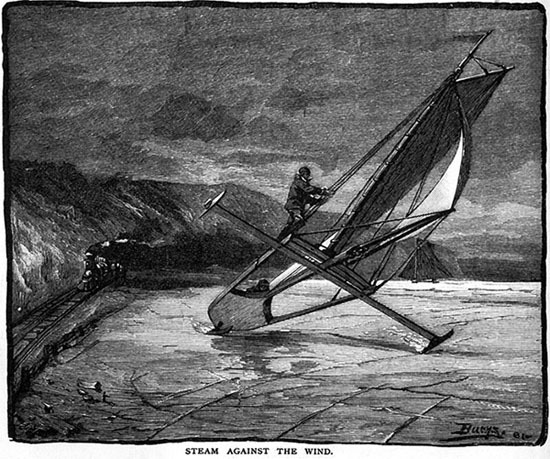 The milder winters of recent years have meant that ice yachting has been regulated to the bays and smaller shoreline stretches of the river. 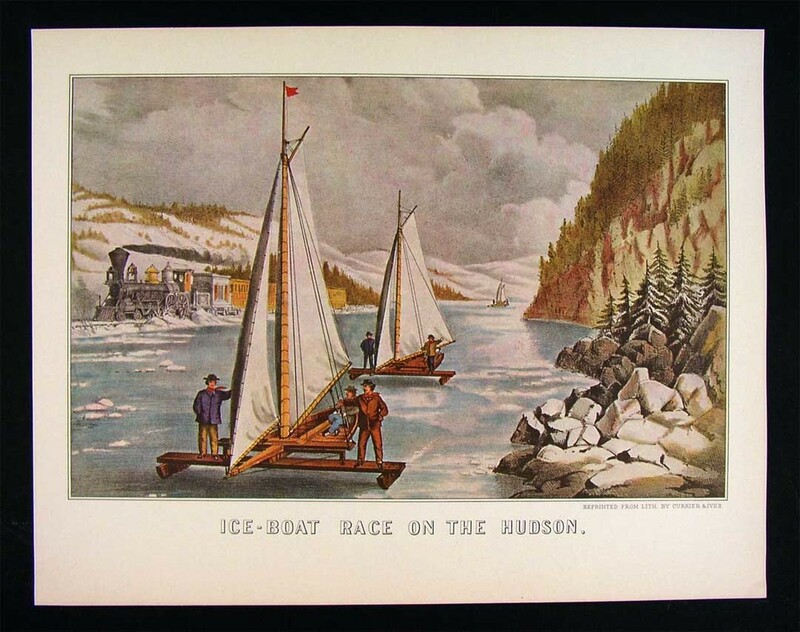 This winter, with its copious amounts of arctic air, has produced enough ice to allow for iceboating across large stretches of the Hudson, just like “the good old days”. The prospect of watching ice yachts out on the river, not to mention a day that promised some sun and temperatures soaring into the low thirties, prompted me to drive down to Barrytown and check it out. It did not disappoint. A line of parked cars along Station Hill Road belied the local interest in the Rendezvous. Passing by the charming Barrytown post office (now defunct) then trudging along the tracks behind the iconic hudson river villa Edgewater’s shuttered backside, I soon caught a glimpse of the throngs of people and scores of crafts. There was only one challenge in getting a closer look. Informed by myriad crashing through ice scenes in movies, I am fairly confident the odds of me being the hapless soul destined to breakthrough the one freakishly weak spot in the otherwise strong surface and plunge into the icy darkness below are fairly high. 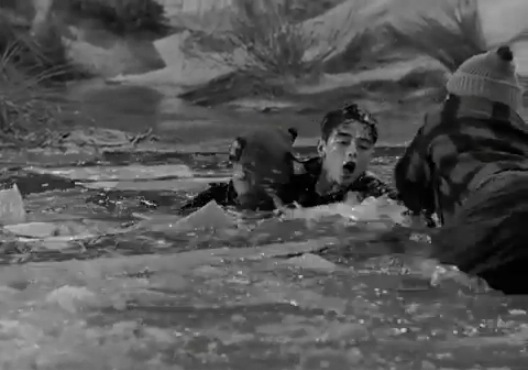 While things could end well, like they did for George’s little brother Tommy in It’s A Wonderful Life there was also the chance of sharing the same fate as Damien’s cousin in the The Omen 2. Ordinarily I would be content to watch from a spot close to the shore, but yesterday the dozens of trucks parked on the ice mocked my fears, and the sounds of laughter from the ice proved too alluring. After emptying my pockets of some spare change and gum to lighten my bodyweight and ensuring proper identification was securely in my pocket in the eventuality my body was next to be found in the spring thaw, incorporated into a beaver dam farther down river, I gamely trod out. The sight of the vessels up close, smiling faces on nearly everyone out there, and the unique clattering made sound by the boats as they passed by me on the ice more than rewarded any risk I had imagined. Having previously observed these vessels only in pictures or occasionally on land, I was familiar with their basic design. What I was not prepared for was the sight of them in their natural habitat. The well-designed framework of an ice boat is no better illustrated and appreciated than when set of against the clear white backdrop of a frozen expanse of ice. Watching them race down the river at a distance, sails unfurled and swollen by the breeze, they could easily pass for a water-going sailboat, lending a surreal air to the winter scene. Either stationary or in motion, the effect was compounded by their sheer numbers, and the views from the center of the river served to remind me why this is one of my favorite places in the world, even with a foot of snow on the ground in March. The photos I took yesterday can only hint at the spirit and excitement of being there in person. 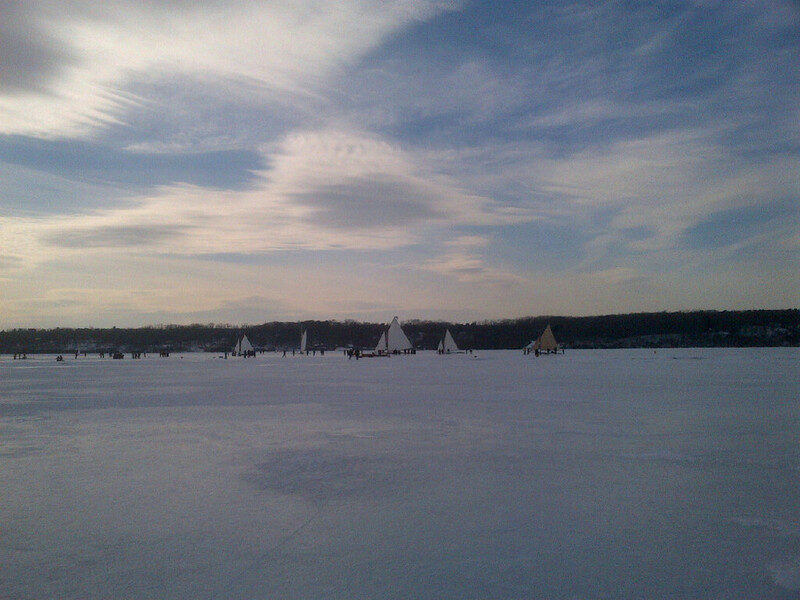 To learn more in-depth information about ice yachting on the Hudson, click here. For kindred spirits who would also like to know how to survive a fall through the ice, well this link is for you. Mar 20 The Day Eleanor Roosevelt’s Seaplane Stopped Here for Gas.